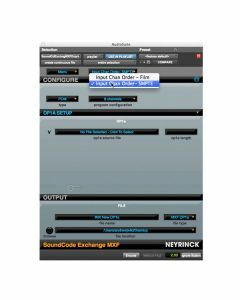 SoundCode Exchange MXF is a set of software tools that provides MXF file workflows for Pro Tools and Quicktime Player. It provides HD and SD MXF video playback in a Pro Tools video track and in Quicktime Player. It also features simple audio import from MXF OP1a files, in addition to audio layback to MXF OP1a files. SoundCode Exchange MXF makes import as simple as importing a Quicktime movie. SoundCode Exchange MXF includes a simple utility app called MXFToProTools. Just open the MXF file in MXFToProTools and click OK to create a tiny Quicktime reference movie. Then drag the Quicktime reference movie into Pro Tools and Pro Tools will present the Quicktime import dialog. Within seconds you will have a video track that is playing your HD or SD MXF video. And you can optionally copy and import the audio from the MXF file into the Pro Tools session. SoundCode Exchange MXF supports a wide variety of MXF formats and video codecs giving you compatibility with MXF files commonly used in television broadcast. SoundCode Exchange MXF lets you play back MXF files directly in Quicktime Player. Just double-click an MXF file and Quicktime Player can directly open the MXF file for playback, export, and examining movie properties. SoundCode Exchange MXF and SoundCode Exchange MXF Import support a wide variety file formats and video codecs. OP1a and OP-Atom files are supported for video import and playback. OP1a files are supported for audio import and playback. OP1a files are supported for audio layback from Pro Tools. D10, DV, DNxHD, AVC-Intra, and XDCAM formats are supported. Quicktime 7 provides built-in video codec support for DV. Third-party video codecs are supported for a wide variety of industry standards. After you have finished editing the audio for an MXF OP1a file, SoundCode Exchange MXF lets you lay back the finished audio to an existing MXF OP1a file. Simply highlight the finished audio in the Pro Tools timeline, open the SoundCode Exchange MXF Export plug-in from the Audiosuite menu, select the existing OP1a file, and click Export. Faster-than-realtime, the plug-in will duplicate the OP1a file and replace the audio with the audio in the Pro Tools timeline. Because the OP1a file is duplicated and not authored from scratch, its structure is completely duplicated and you can deliver a file exactly as it was received by you which gives you full confidence that it will be compatible with your clients' MXF playback systems. MXF To Pro Tools Utility. Pro Tools MXF OP1a Export Audio Suite Plug-in. High Definition MXF Audio/Video for Pro Tools and Quicktime Player. MXF OP1a Audio Import to WAV. MXF OP1a / OP-Atom Video Import to Pro Tools. Codec Support: D10, IMX, DV 25/50/100, AVC-Intra, XDCAM HD 422, DnXHD. Pro Tools Audio Suite Plug-In - MXF OP1a Export. Windows XP/Vista/7 and Mac OS X Support. Import and Export Features - Includes the SoundCode for Import package. SoundCode Exchange MXF software uses iLok USB key licensing for simplicity and flexibility. A single iLok key can be used to authorize all tools on any computer system with SoundCode Exchange MXF installed. If you need to use SoundCode Exchange MXF on one system one day and another system the next, just move the iLok USB key. Standalone Mac OS 10.4+ and Windows XP/Vista/7 (QuickTime for Windows required). 48 kHz sample rate only. Pro Tools - HD/LE 7.4 and later. Video Codecs from Apple Final Cut Pro 7 or Calibrated Software: D10, DV, DNxHD, AVC-Intra, and XDCAM Formats.